It’s the dog days of summer and in the south that means a lot of lazy front porch sitting with a cold glass of lemonade or sweet tea clutched in your hand like a lifeline. But, it can also mean floating down the river, casting a line, or diving in to cool off. In Johnston County, we’ve got tons of outdoor activities for both the adventurous and the idle at heart. You can do all these activities in one trip if you make it a weekend escape to Johnston County. But Johnston County is also close enough to the Triangle to include all these in your list of day-trip, must-do Raleigh activities. If you’re traveling up or down I-95 this summer, stop and let the kids play off some of that energy. Many of the activities below are near the interstate. Open May to September, Tucker Lake offers swimming, hiking, a playground, and picnic area. 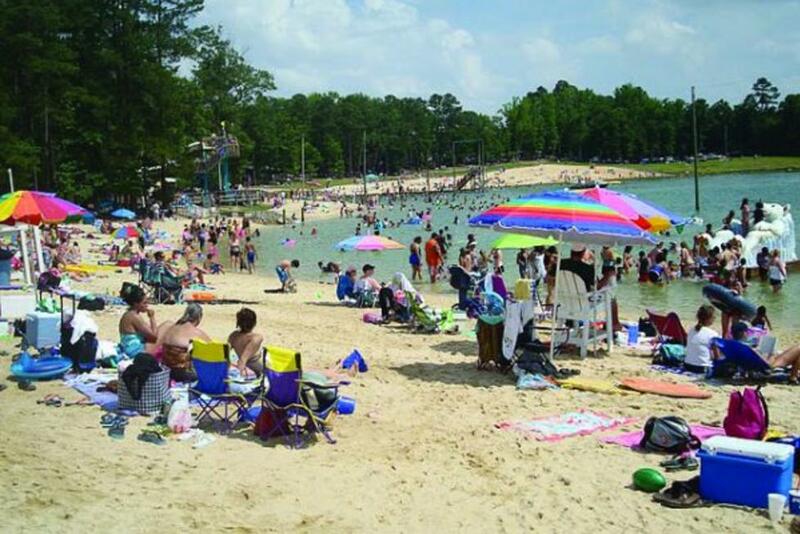 The lake is spring fed with sandy beaches, a rope swing, slides, and paddleboats, kayaks, and canoes available for rent. Lifeguards are on duty at all times, which makes this the perfect place to take the whole family on those hot summer days. You can bring your own chairs, rafts, food, and non-alcoholic drinks to enjoy as well. Tucker Lake is located in Benson and does have a daily admission cost. You can find more information by visiting the Tucker Lake website. You could say that Hexagon Wake Park is for the athletic or adventurous, but their first-timers class makes sure that everyone who wants to give cable wakeboarding a try, can. For the uninitiated, cable wakeboarding is when a series of overhead cableski wires pull you through the water instead of a boat. Hexagon shares space with Tucker Lake, though they have separate entrances, and parties that do not want to wakeboard can simply hang out at Tucker Lake. Both kids and adults of varying ages can brave the wake course and there are rentals available if you don’t have your own equipment, including the board, life jackets, and helmets. For more information on Hexagon and for a list of their pricing, visit their website. If it’s too hot outside for the little ones, or you’ve got a case of the sunburn, try the indoor pool at SRAC – also known as the Smithfield Recreation & Aquatics Center. Along with an indoor pool, they’ve got a splash park for the little ones to enjoy and great locker room facilities. If you’re visiting the area and/or are not a member, SRAC offers drop-in fees which you can pay to have access to the pool and the gym facility for the day. For more information, check out their website. Scenic and historic, the Neuse River offers a gentle and relaxing ride. There are plenty of places along the Neuse in Johnston County to put in your own boat and go. 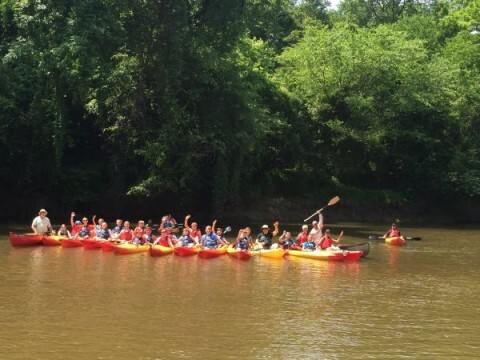 But if you find yourself without equipment and know-how, contact Neuse Adventures Canoe and Kayak Rentals. They’ll get you all set and drifting down the river in no time. They also provide the drop off and pick up transportation for 2-hour quick-trip floats and longer 5-hour river excursions. Find out more about their float trips and rentals at their website. Smith’s Nursery is family owned and operated. If you’re a Johnston County local, or an avid berry-picker, then you know that Smith’s is the place to be during strawberry and blueberry season. But, Smith’s has tons of other fun activities and seasonal produce options throughout the year – pumpkin picking, hayrides, and a millet maze. You can also fish their pond. All you have to do is show up with your own equipment and bait, pay a $5 per person daily fee, and drop a line. Smith’s has 2 stocked ponds and restroom facilities. If you get tired of catching, you can always mosey on over to the produce stand for some ice-cream. Smith’s asks that you catch and release and that you fish from the banks, no boats. If you’re a local or you’re going to be in the area for a while, yearly family passes are offered for $125 a year. For more information about Smith’s visit their website. Remember your sunscreen and to stay hydrated while you’re having fun. For more information about things to do in Johnston County be sure to visit our website page as well.